Shop Smart offer: A "Lifetime" shopping bag, on showing your Shop Smart card. (One per customer). See other offers in store. 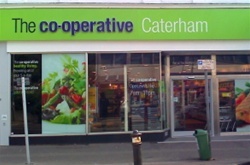 The Southern Co-operative are pleased to open in Caterham in the old Woolworths building. The store opened on June 5th and together with Oxted is part of a pilot Share of the Profits scheme. Please see in store for details and a link is here. With over a 120 stores in the south of England, food retail makes up our primary business. Our success is built upon conducting our business in an ethical and socially responsible manner. As well as selling ethical products, we are keen on making a difference in the communities we operate in. The Caterham store has a wide range of products and we hope to see you there soon. Location Link In the old Woolworths store. Google update pending. Copyright © www.shopsmartcaterham.co.uk. All Rights Reserved.